Ciao'd while nibbling peppermint bark. Happy Holidaze! My fingers ache from online shopping. My feet relentlessly remind me (at 3 AM) of time spent cooking and baking. My derrière seems to expand every day, no thanks to cocktailing and celebrating at various holiday soirées. It's time for a rejuvenating, healthy bowl of soup. And this one's a winner. 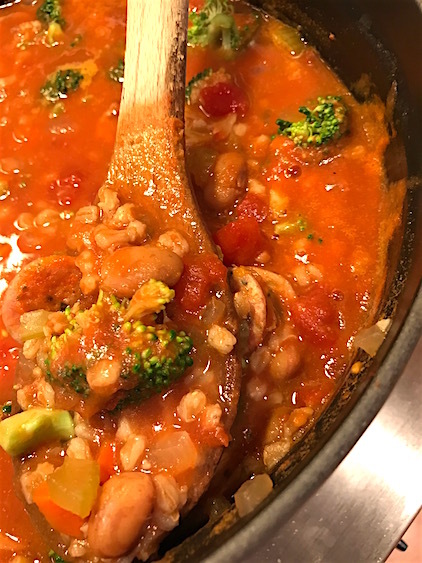 Farro Soup with Beans, Broccoli, and Chicken Sausage is just the foundational recipe. You can add other vegetables (cubed potatoes, green beans, and peas come to mind). If you are of the vegetarian persuasion (shout out to Glo and Randee), you can take that route. Simply omit the sausage and use water or vegetable stock in place of the chicken stock. Go for broke and add tubetti pasta for a farro-y take on pasta e fagioli. I'm giving a dinner party this weekend. Rather than serving an over-the-top menu, I'm thinking of offering this soup with warm crusty bread and a salad. For real. Cozy vibes all around! Borlotti beans, also known as cranberry beans, complement the earthy flavor of farro. Sure you can use canned beans (use 2 cups if you opt for this route) but the texture of the cooked dried beans is so much more substantial. You can also opt to make this a vegetarian soup. Simply omit the sausage and use water or vegetable stock rather than chicken stock. This is a hearty, satisfying soup that tastes even better on the second or third day. It freezes well, too. Place the beans in a large, heavy pot. Cover with water about 2 inches above the beans. Cover the pot, bring to a boil, and then remove from the heat. Let the beans soak in the water for 1 hour and then drain. Heat the oil in a large saucepan or Dutch oven over medium-high heat. Add the sausage and cook until browned, 2 to 3 minutes. Transfer to a plate. Add the onion, celery, and carrots to the pot along with a ¼ teaspoon salt and ¼ teaspoon pepper. Cook, scraping up any brown bits of sausage from the bottom of the pan, until the onion has softened and turned translucent, 5 to 10 minutes. Stir in the garlic and cook until fragrant, about 1 minute. Add the farro, beans, tomatoes, sausage, and stock. Bring to a boil, and then decrease the heat and simmer until the farro and beans are tender, about 1 to 1 ½ hours. Add the broccoli florets and cook until tender, about 5 minutes. Add the parsley and stir to combine. Serve the soup and pass the Parmesan at the table.